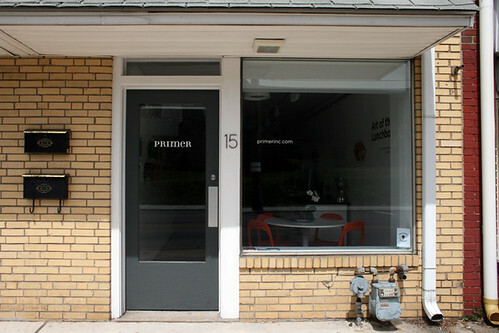 Primer is a design agency in Hatboro Pennsylvania (just outside of Philadelphia) who occupies a wonderful space, both a full time design office and a part time art gallery. The founders of Primer decided to extend their mission to include participating in their business district's First Fridays held by local galleries. This gave them the chance to contribute to the community and make themselves known, as well as create opportunity for artists that might not get to show in a local gallery. Great idea. We call it a microstudio because of it's diminutive size – 10x40' – small, but mighty! The storefront was built in 1950 and was originally a shoe repair shop. It has been an insurance office, state rep office and craft store before we took up shop. 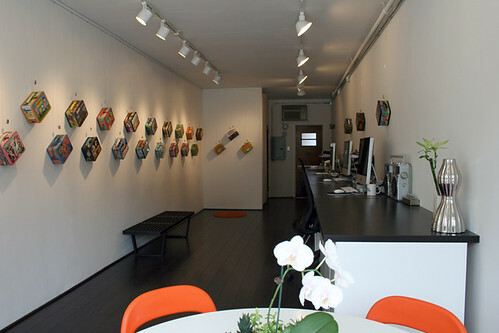 Now the space functions as half design studio and half art gallery, featuring monthly revolving artist shows in conjunction with First Friday Hatboro. 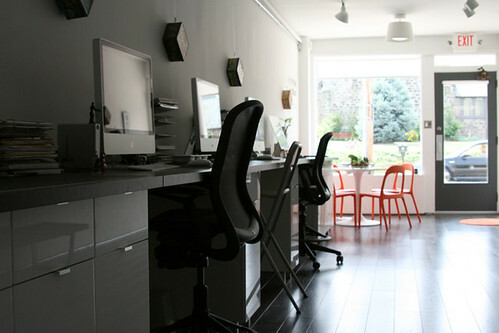 The space features a single counter-top-height 25' worktop along one side of the space, made from IKEA kitchen cabinets and countertops. We bumped the cabinets off the wall by an inch or so, while keeping the countertops flush, to run conduit and hide computer wiring. The cabinets provide tons of storage space, but their height required the use of tall chairs; we use Knoll Chadwick high task chairs and folding bar-height stools (when needed). This height also makes it comfortable to stand and work. There is a small bathroom at the back, and we built a wall the same width a few feet off from it to hide the utilities and make a sort of storage closet for bigger items, cordoned off by floor-to-ceiling curtains. We've installed a hanging rail system around the perimeter of the main space, just below the ceiling, so as not to damage the plaster walls when hanging art (or in this case, lunchboxes!). Dimmed Juno spots and shovelheads illuminate the artwork, and a large IKEA fixture lights the entrance and conference area. Conference table and chairs are also from IKEA. Flooring is veneer with thick cork underlayment to cut down on the echo.